I went back to the oldest park in Wichita for lunch today. I continue to explore the new 11 inch coil on the Deus. It’s a new paradigm I tell you. So I decided to try a new area of the park. It’s funny how a small park such as this has ‘areas’ but yet it does. Right away I began to get signals at a spot that didn’t have signals before. The first target was a 1907 Indian Head cent. Soon after, another 1907 Indian came out of the ground. Then a couple of memorials, then a cool medical pin mixed in with trash. Last, I pulled a 1918D wheat cent. X marks the spot, the saying goes. I’ve been hunting a site for over a year now where once a neighborhood thrived. It has been a chore to locate the backyards and front yards, where modern construction has not covered them. 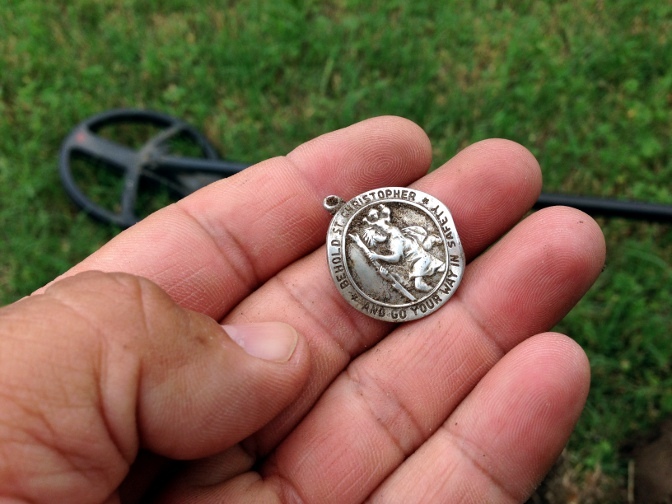 Last year, I found a backyard that produced two Indian cents and a Walking Liberty half. An erstwhile front yard produced a number of wheats. Then, I found pieces of old brass tags, and pieces of toy cars and such. Last, I got a sweet signal that spoke of old coin. 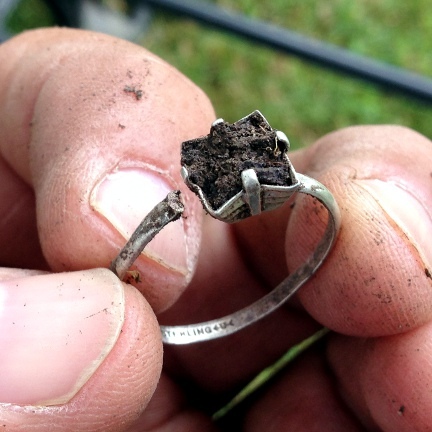 Maurice (my Deus metal detector) didn’t lie. 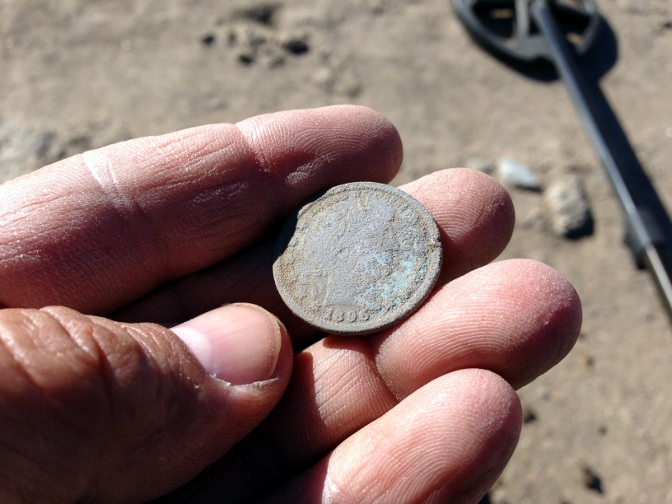 In the hole, I found an 1890 Indian Head cent, my tenth this year. 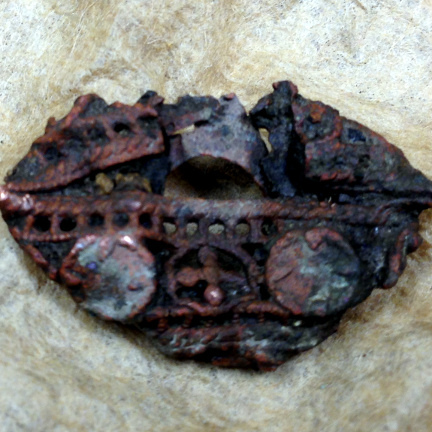 Although it has iron incrustations, the coin shows little wear, leading me to conclude that it was dropped near its mint date. It is not unusual for me to find early stuff like this along with relics and coins from later years since the neighborhood stood there from Wichita’s early years to the 1970’s, when it was torn down. I am happy to have a new spot to scrub in search of cool coins and such. Met up with friends today to hunt an old park. We hunted for 6 hours and although the morning started cool and cloudy, the sun eventually came out and the day turned into a beautiful Spring day. 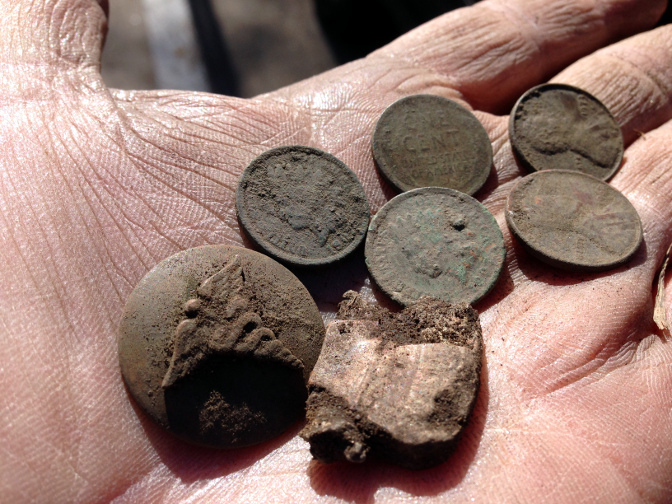 For my part, I dug up two silver Roosevelt dimes and two Indian Head cents. The silvers were shallow, both at about 4 inches deep but the Indians were much deeper at around 8 inches. Try as I may, I could not find the Seated coin I went looking for. 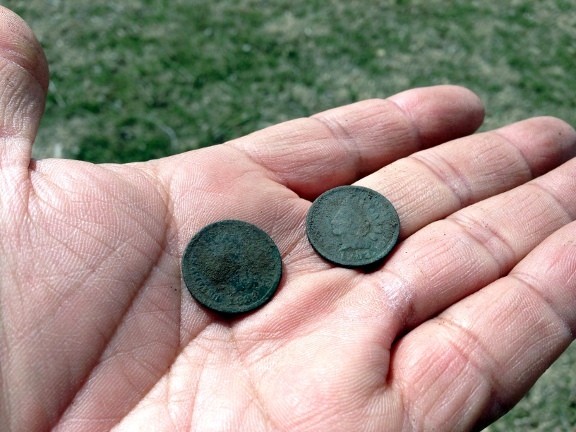 Nonetheless, I LOVE seeing the silver coins when they first come out of the ground. 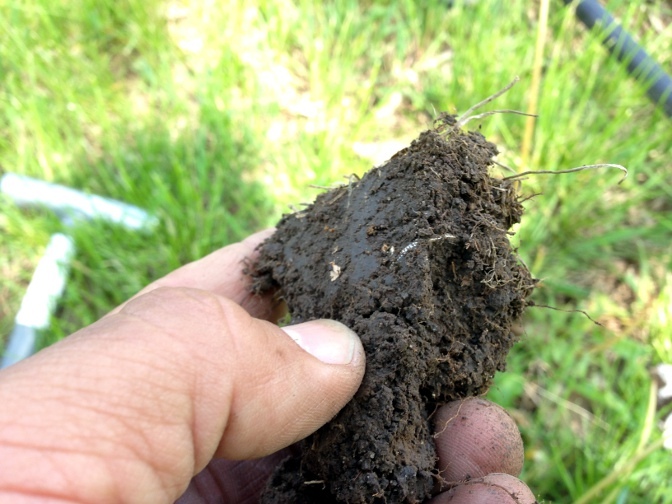 I particularly love to see the edge of a silver coin sticking out of a dirt ball. For now, my first Seated coin is still in the ground; somewhere. I tried to hunt today. I really did. I went out to Riverside park here in Doo-Dah and gave it the old college try. I spent about 30 minutes in the wet, cold, windy park looking for that Seated that I KNOW is there. I just couldn’t hang. Couldn’t do it. I shamefully turned Maurice off and went home. 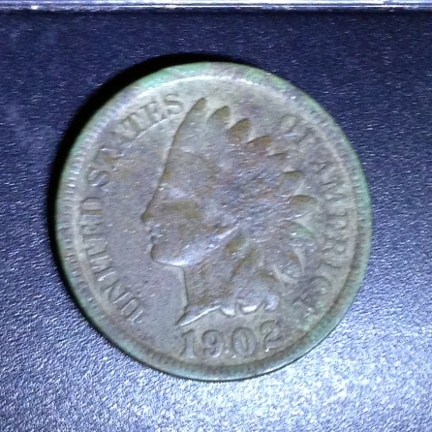 But not before I pulled this really cool 1902 Indian Head cent from the cold dirt! If I keep this up, I will easily beat my 2012 Indian Head count. Mommy, why can’t I find a coin? I took my trusty XP Deus metal detector, Maurice, out for a spin at lunch time today. The sun was finally out and the temps hovered in the low 50’s with a brisk cool breeze. Since I have grown in confidence with the Deus, I decided to hit a spot in downtown Wichita that I had hunted before. The site has an interesting history as it is the northernmost part of what was once an island in the middle of the Arkansas river. The island was filled in in the 30’s in one of those famed WPA projects. The island was known as Ackerman’s Island and it was large enough to accomodate a baseball field and an amusement park. Anyway, as far as I can tell, there were buildings in that lot since the island was filled in and today, there are remnants of multiple foundations and even, I swear, a buried railroad line (although I haven’t dug it up to find out for sure). In other words, it’s tough going if you want to hunt it. But, as I said, since I think I am Mr. Big Deus Bridges I went there for lunch. 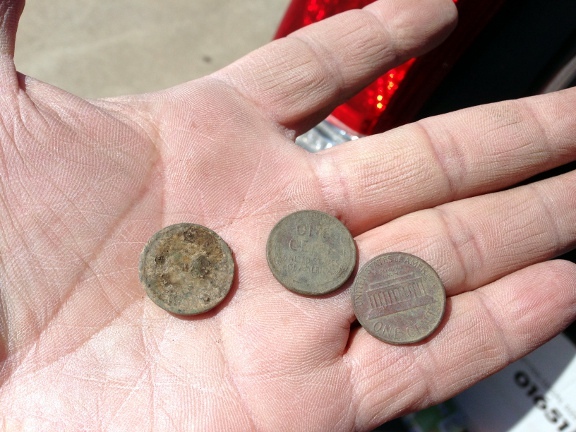 By the way, this is only the second one cent trifecta I’ve dug up in one single hunt. 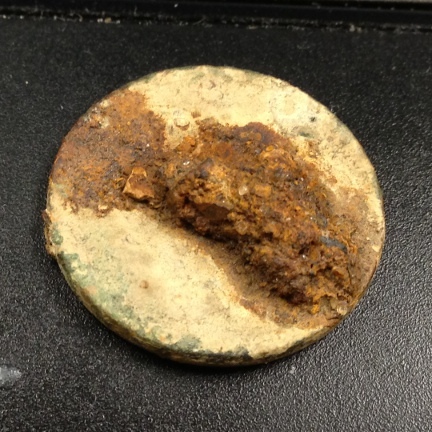 Yep, that’s a chunk of rusted iron stuck to the coin. I am very impressed that the Deus not only presented me with a semi-sweet signal but also with a nice solid VDI. The Deus is a master of iron. Now you know why it’s hard to pull some coins out of the ground! 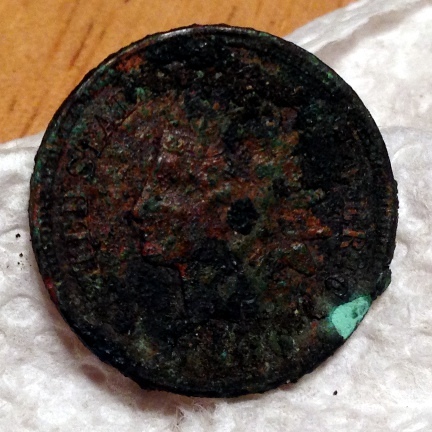 I wonder if I would have been able to find this coin with any other detector. Now, where is the silver?! I returned to my beloved hobby after being given the all-clear from the doctor. Now that we are doing therapy, he said I could return to my normal activities. Well, it may be a stretch to call metal detecting a normal activity but I dusted off Maurice and hit my deep silver park. 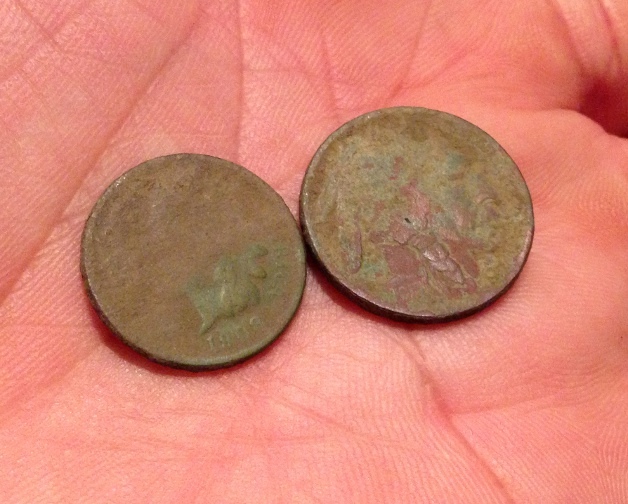 I did my first hunt yesterday and I managed to dig up a 1909 wheat. 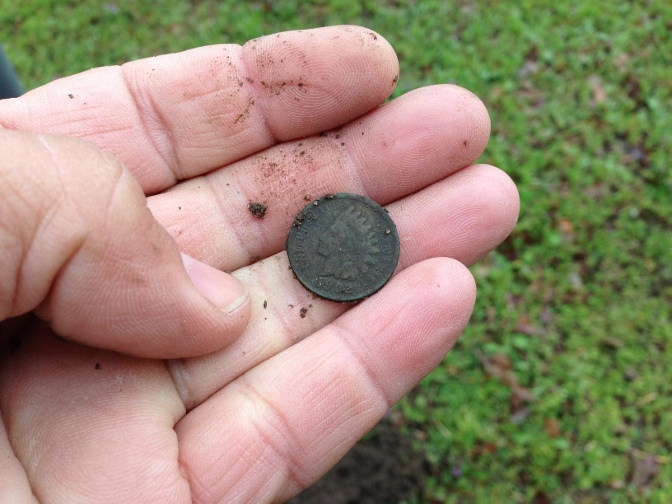 No VDB nor a mint mark on it unfortunately but still, it was the oldest coin I had ever dug from the deep silver park. This park hearkens back to 1901 and I have always been convinced there were old coins there even if I never found any. Today, I went back to the spot where I found that 1909 wheat and eventually got a choppy signal next to some trash. 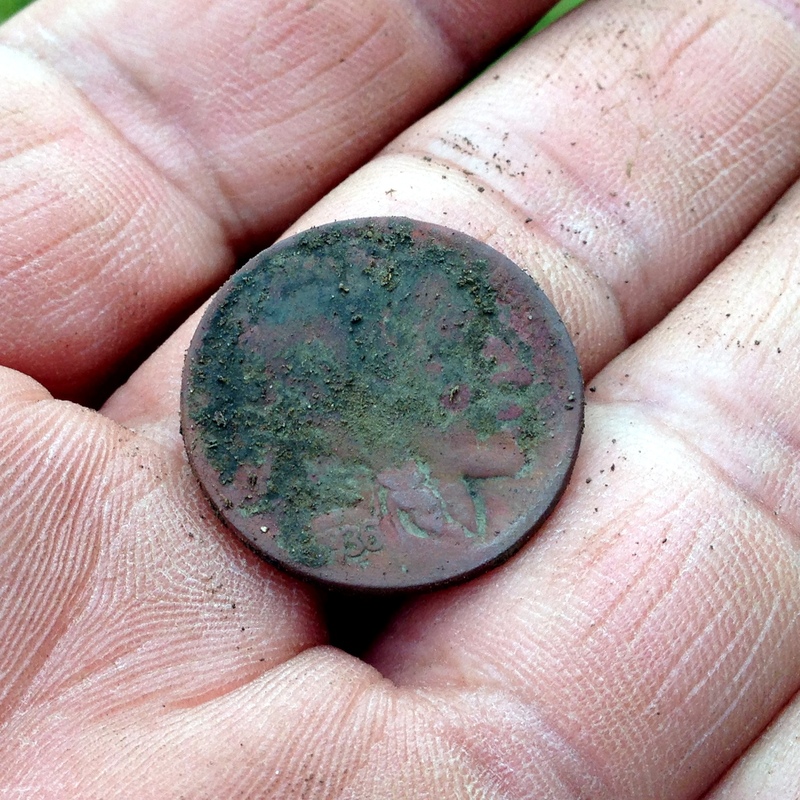 At about the eight inch mark, I pulled a 1902 Indian Head! I was grinning like a fool. Just a minute or so before, a group of 10 year olds came by to check out what I was doing. Too bad they left before they could see the cool Indian Head. Before I covered the hole, I stuck the pinpointer in and I got another hit. 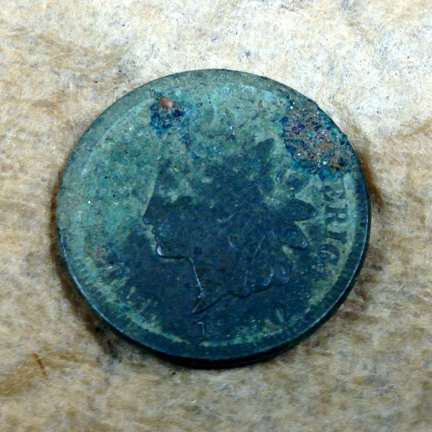 That signal proved to be an 1883 Indian Head! My first ever Indian Head coin spill. I only wish they had dropped a Barber coin or a Seated! Oh well, it was not a bad lunch hour hunt.